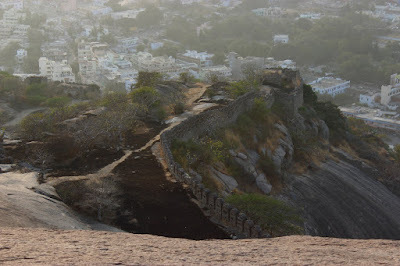 Bhongir fort was on my list of places to visit for months, somehow we could not decide on a trip. One Sunday morning we made a plan to leave afternoon so that the when we reached the hill sun should be down. 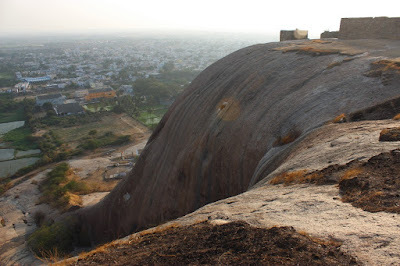 The distance from Madhapur, Hyderabad to Bhongir is about 70 kms, estimated driving time would be 2 hours or so. 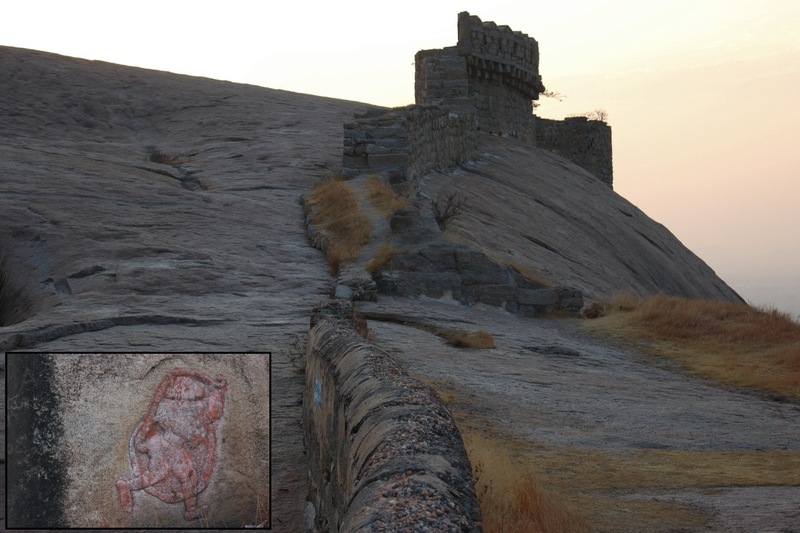 We should reach by 4-30 pm; we should be able to see the fort in 2 hours and then leave by dusk. We had light brunch and napped until 2 PM. We left home by 2-30 and took off towards Secunderbad. 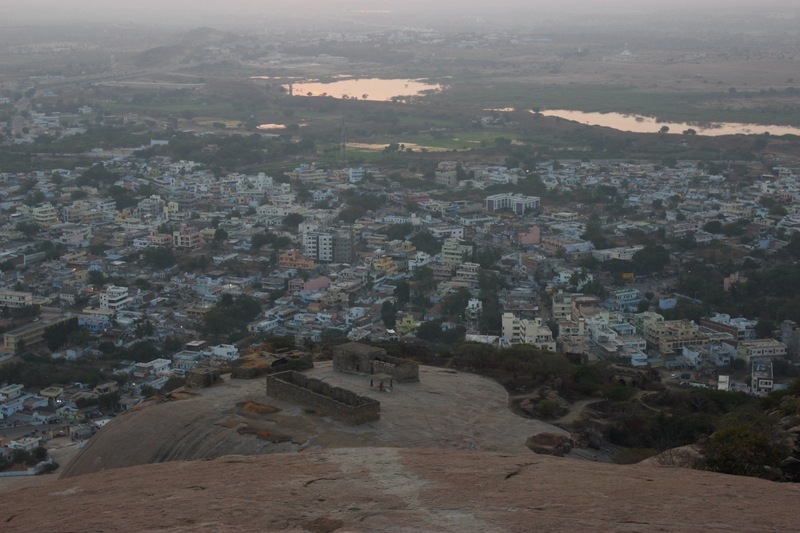 We had set the destination as Uppal, the route we took was the inner ring road. We managed to reach Warangal road at Uppal. From there the journey was little slow mainly because of narrow road. Once we reached ORR, the road widened and made good speed. About 6 kms before Bhongir we filled petrol at a IOC bunk, washed the windscreen. Soon the hill came into view. We turned off the highway towards the town and found our way to the hill. It was around 4-40 pm. I estimated a 25 minute climb to the summit. 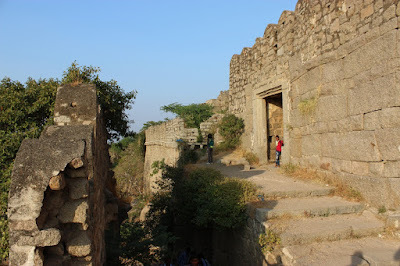 The present day entrance to this fort might have been the original entrance. This is the least steep way up the hill. The entrance is manned by a entry fee booth, Rs.10 for adults. Close to booth is a slightly disfigured stone sculpture of a male god with four arms. This sculpture could be of Kakatiya time. These steps are recently made. At the end of the new steps starts the ancient stairway, these are steeper than the steps below. One interesting thing in this picture is the wall at the end of the stairway. That's a curtain wall around the gateway. How the builders have maintained uniform height. 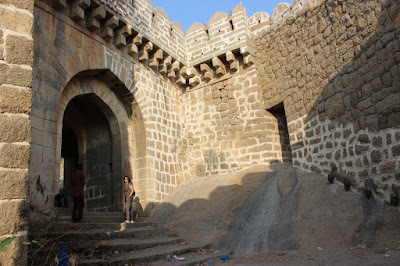 This is the gateway with the curtain wall on the right. There's a small opening in the curtain wall, that could be an escape route in emergency situations. This path goes along rampart wall on the western slope. 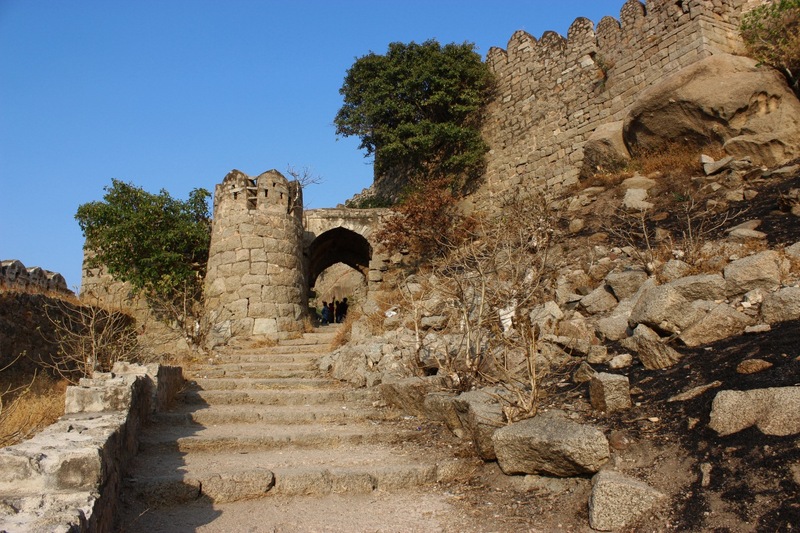 We reach another gateway with a small tower, large enough for one person to stand at the top. This is the other side of the gateway. 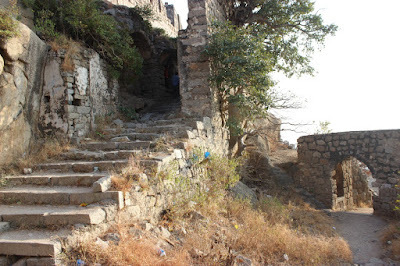 On the left is a short stairway with hairpin bend which leads to the third and final gateway. This entrance too is concealed by a curtain wall. View from the bend in the stairway.. on the left is the curtain wall and on the right is the gateway. The wall construction technique is slightly different here. Notice the alternating layers of thick and thin blocks. 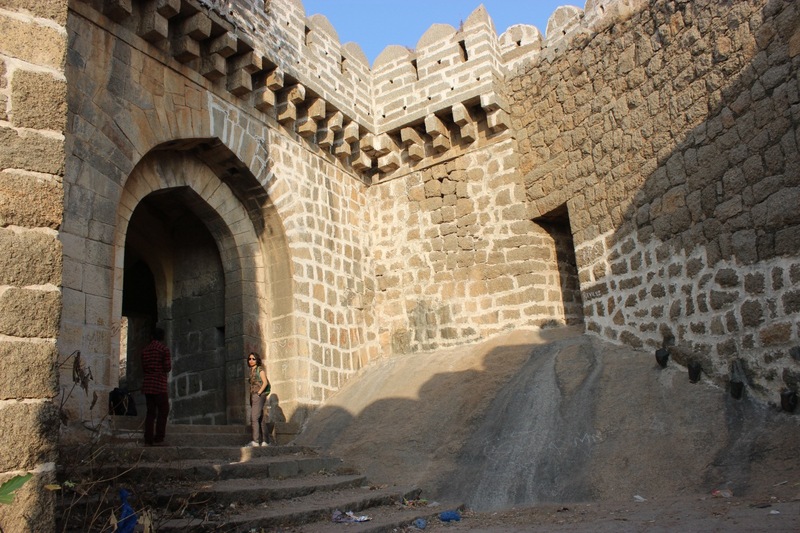 The wall and door frame are of same period but the upper wall and merlons seem to be recent, probably built by Muslim kings. 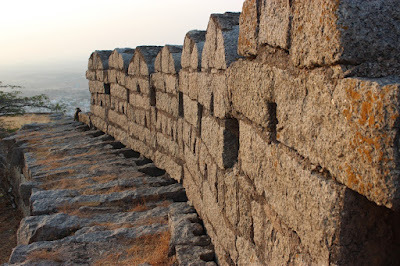 The curtain wall too is recent, mortar has been employed to bind the stones. The final gateway opens up to a wide open space; there's a shallow pit on the left where rain water accumulates. Beyond the pit, the hill rises up with lot of rock formations. Though a natural barrier, builders have raised rampart walls for better security. Time was a constraint so we had to skip that part of the fort, instead we chose to go straight ahead.. The dirt path ended at this point and we'll walking on the rock.. the monolith. Yes, Bhuvanagiri is a monolith; oval shaped in plan; 1200 meters (3937') long, 626 meters (2053') wide and 160 meters (525) tall from the ground level. At this point we are about 60 meters above ground level. So have another 100 meters to ascend. By now Pushpa had already complained of aching legs two or three times. I told her that we are half way up already, she could relax for few minutes while I explored these ruins. 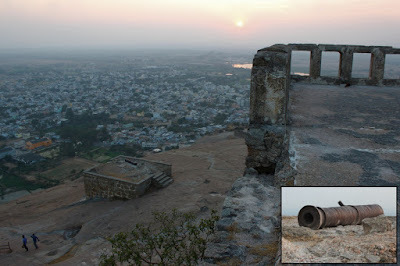 There's one Mantapa, three buildings and a small sentry platform. These were probably the officers and soldiers quarters. 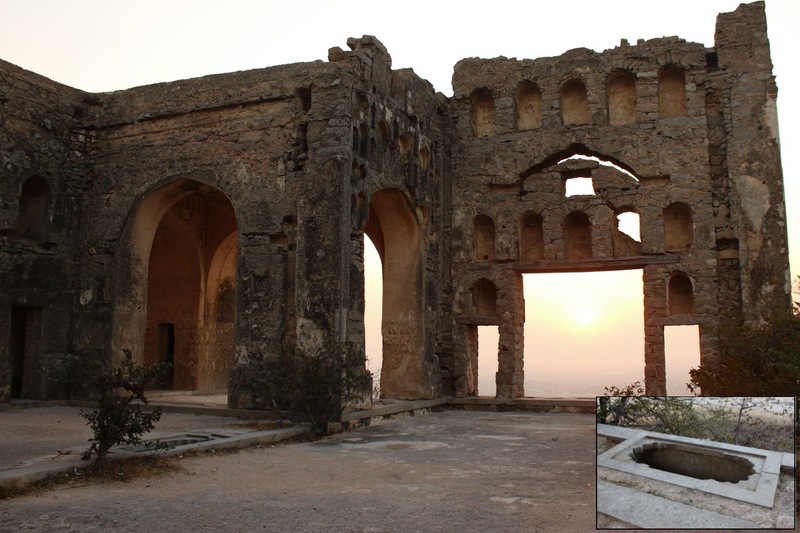 If you notice the wall towards the right, two arches have been filled in to make it a closed structure. View from the sentry platform. I'm imagining how it would be at night, to be sitting here in a small group huddled around a fire. Surely, soldiers back then would done that.. those days without any glaring electric lights, sky would be dark with glittering stars. We can only imagine such things.. sigh! We continue with our ascent. To our right a wonderful sight came into view.. a graciously smooth slope. 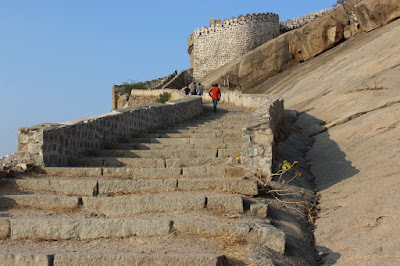 If there was a sand-pit at the bottom and I guess one could slide down safely.. just a thought :) I want come back to Bhongir one day and take a shot up this slope, it would be a great sight. This one straight steep path. 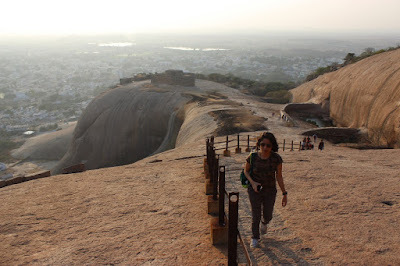 On my left is an almost sheer cliff hence the railing to keep people in safe zone. I chose to walk outside the fence but remained close to it. On the right, there are three curved walls; two are in view here while the last one is behind me. These are dams to retain rain water. In fact beyond the second one, you can see another wall, there are two more such rain water tanks. All in all, we could count nine water tanks however, the only the one at the summit had water in it. From here, the summit is few minutes away, the ruined palace and a cannon platform were already in sight. The palace-in-ruins. It would have been a grand structure in its heydays. Its architecture is Islamic, so it must have been built during Nizam's time. Perhaps the Nizam or one his commanders must have got it built. 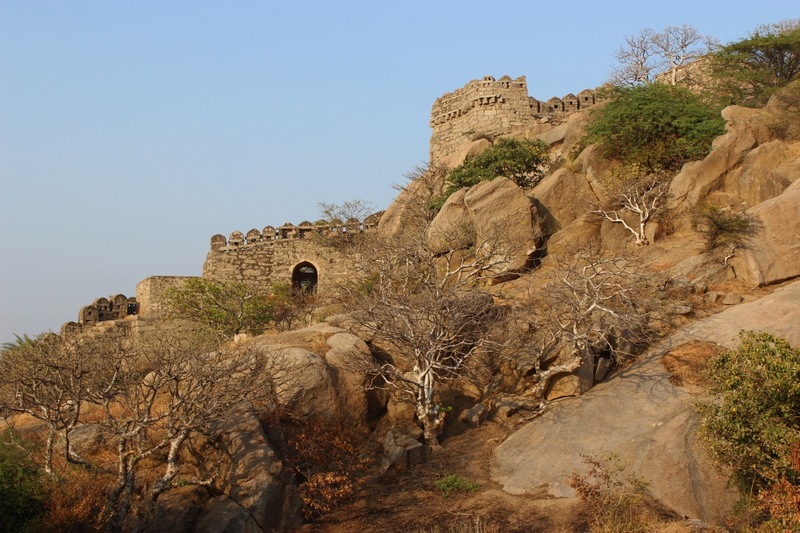 As mentioned earlier, the fort was renewed by Muslim rulers but the original fort was established by the Chalukyan emperor Tribhuvanamalla Vikramaditya VI. 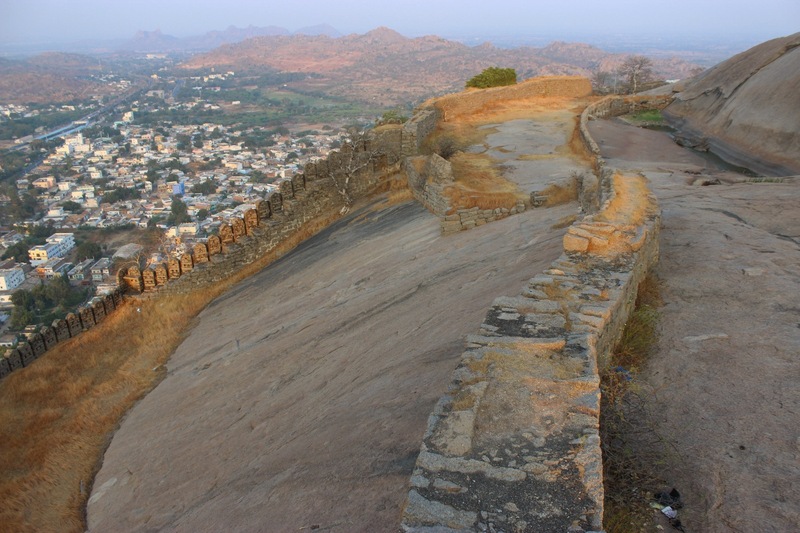 So the fort was known as Tribhuvanagiri which later shortened to Bhuvanagiri. 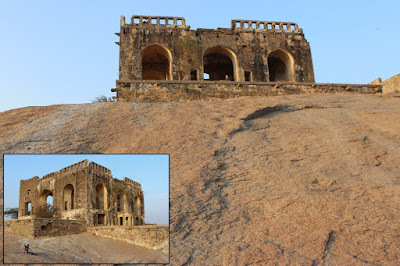 Later the place got the present name "Bhongir" probably the British or Muslim tongues couldn't pronounce Bhuvanagiri so it might have become Bhongir! The hill, no doubt gives a commanding view of the surrounding plains, lakes and neighboring hills. 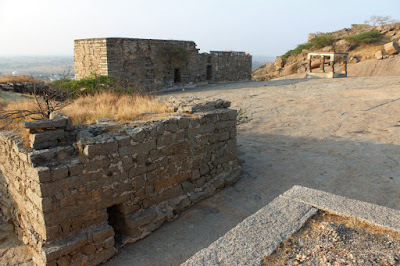 From the palace platform, the unexplored part of the fort came into sight. Wish we had reached an hour earlier, I could have explored those rampart walls too. Well, some other day. Pushpa was tired and she was all set to attack her snack and cool drink. So she settled down on the palace platform. I wanted make good of the remaining time, so I went exploring.. Besides the palace, there are three more structures. 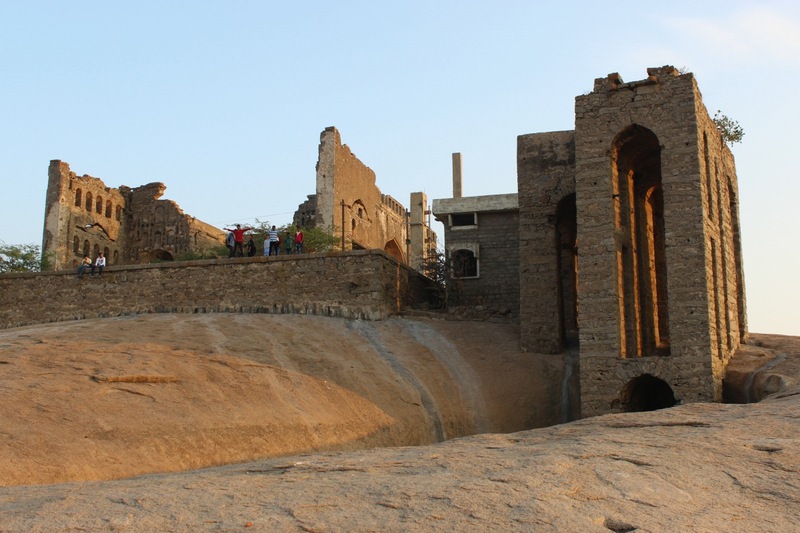 The tall columned structure is a hydro tower which supplied water to the palace. The foot of the tower is in the pit in which rain water is stored. This is the only tank which contained water. My guess is water was pulled manually using ropes & pails and poured into a tank. Surely pipe lines existed to transport water to the palace. In the palace we did see small tanks in the floor and also a larger pit which seemed like a mini swimming pool. So this palace must have been a resort for occasional visit. The other two structures are very recent creations; one seemed like a guesthouse (in neglected state) and the other one seems like a police transmission center. This is the northern face, though steep walls have been built for better security. In fact at this point, you can see two parallel walls. I'm standing on the shoulder, the merlons are 7 to 8 feet tall. In the floor are gun holes. Solid walls indeed. I went down along the wall. The wall I stood on earlier is seen here.In the foreground is a wall, to the left of the wall is another rain water tank. From the look of the grass in the pit, it seems the tank had dried a month or two ago. 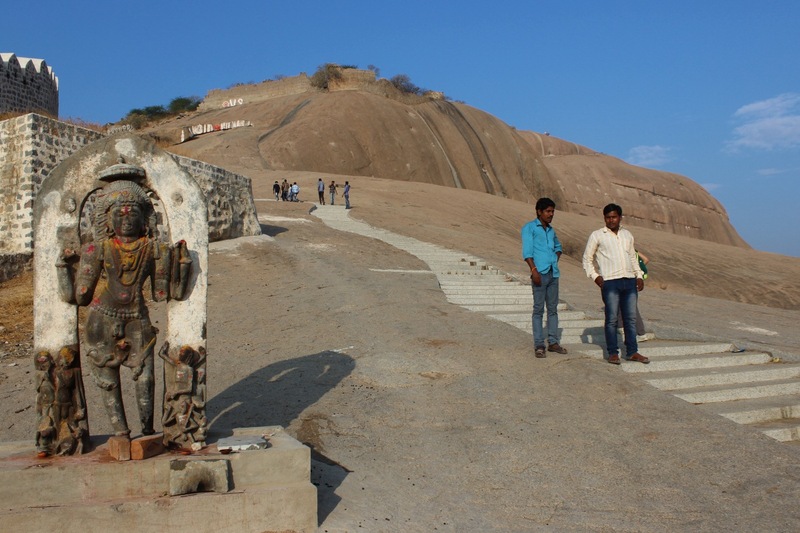 At one end of the pit I found an embossed image of Lord Hanuman, the god of strength and valor. This path went further, around the hill and comes around the palace, on the southern face. Rampart walls starting from the northern side, go around the eastern face until the southern face. I did not bother exploring further mainly because of time and also Pushpa was alone. Back at the summit. The palace is small but spacious. In the floor level, we could see several water tanks (see inset). This must have been an courtyard. There were two halls with great arches. Up here it was quite windy, so these great archways allowed free airflow keeping the palace cool even on hot summer days. I found the stairway to the palace terrace. That's Bhuvanagiri town. The royal members must have had a good time here. Nights would be absolutely peaceful with lot of fresh breeze. The setting sun. That's the gun platform and the gun itself (see inset). There were several other groups of people when we came here, most had left by now. We too decided to leave before it got too dark. The descent was quite fast, about 10 minutes. Back at the fee booth, we stopped by to shoot this statue of a warrior. I checked out the plaque embedded into the base of the pedestal, all I could read were names of politicians. Whoever this 'warrior with a scribe' is, is an handsome fellow. Few minutes later, it was dark. We found a snack vendor and bought some bajji. We headed back towards Hyderabad. We were happy that our planning was a success. Back home Pushpa narrated her version of the trip. 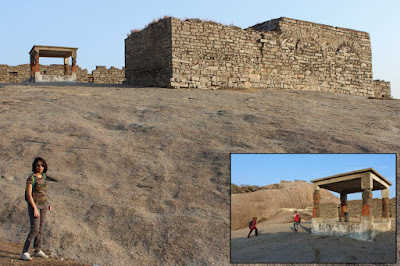 Here's the link to her article in Kannada- ಭುವನಗಿರಿ ಕೋಟೆ ~ Bhuvanagiri fort. 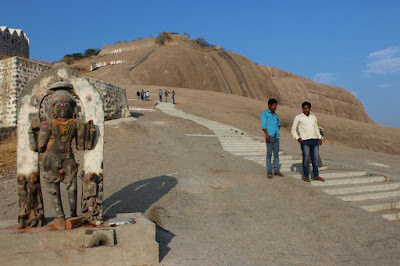 Mid-March we had been to Warangal. 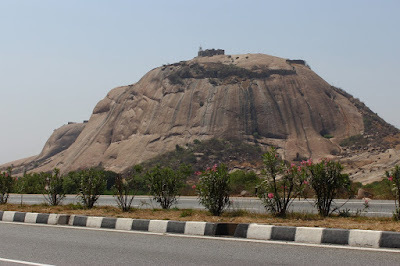 On the way back we got a shot of Bhuvanagiri from the highway. This is view of the hill from the highway, we are looking at the southern face of the hill. 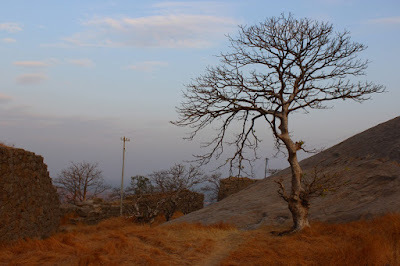 The hills reminds me of Savandurga near Bangalore. 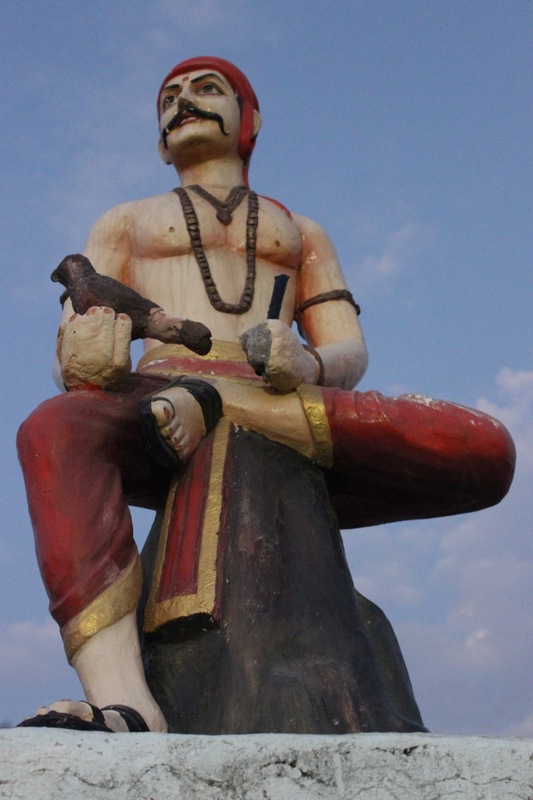 Of course Savandurga is much bigger and higher and wilder. A closer view of the southern face and the summit. 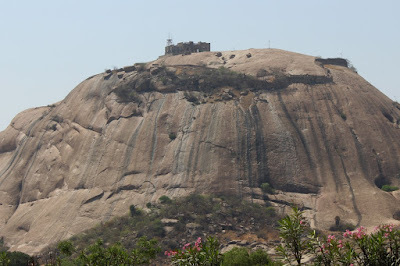 One should visit the hill after rainy season, say between September and November, the hill would be cooler and lot of water bodies with freshwater.